The Mille-Fleurs style was popular in the 15th Century. This distinctive style is thought to be inspired by the custom of strewing cut flowers on fete days in Medieval times became very much in vogue. 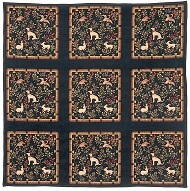 Tapestry throws are loom woven with the finest fabrics in Europe. Fully backed with tassels. Loom woven in Europe with the finest materials. Fully backed with tassels.